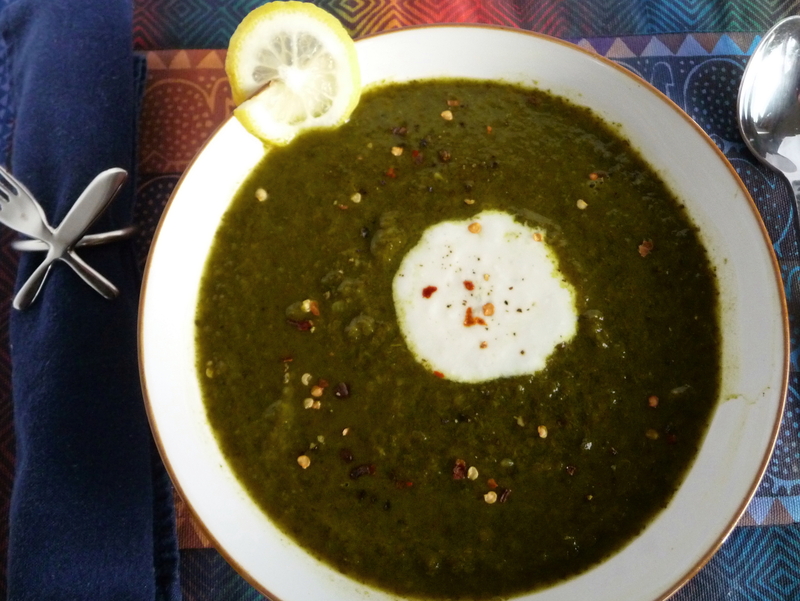 Spinach-Celery-Turmeric-Lemon Soup: A Wee Taste of Scotland? Is it possible to be excited over spinach-celery-turmeric-lemon soup? For me, the answer is a resounding yes. This soup is a revelation for its simplicity, satisfying texture, and profound flavour. When combined with store-bought stock and onion, these four ingredients transform into a deep, rich, and ultra-wholesome soup. To explain my bizarre journey in finding the recipe, we need to return to its origins. I was excited to have found a copy of Baroness Claire Macdonald’s Seasonal Cooking a small charity shop in Glasgow, Scotland, in October. A renowned author of many cookbooks, Baroness Macdonald is the Scottish Julia Child, if I dare take such a liberty – though, with her title, does she need anything more? The Baroness is the chef-owner of the Kinloch Lodge on the Isle of Skye – an inn so well-known that even the New York Times wrote about it as one of the top three dining options on Skye. While we ate at another one of the three New York Times’ suggestions during our day-long visit to Skye, I later recalled Baroness Macdonald’s name. Thus, I was able to spot her book on the shelves of a shop benefiting one of the UK’s health charities. This particular shop was on the main drag of Sauciehall Street in beautiful downtown Glasgow (like “beautiful downtown Burbank,” for those of you who remember the classic 1960s/1970s comedy show, Rowan and Martin’s Laugh-In). To borrow the catch-phrase from Laugh-In, Sock-It-To-ME! It was such a deal for just one quid (slang for one pound sterling, or about $1.50 US) for a classic, which promised 12 months of Scottish cuisine at its finest. Are you asking yourself, what is so Scottish about this soup? You are right to wonder. It really is not, except that the Baroness writes that March (the cookbook is divided by months, with appropriate seasonal recipes) is so desolate on Skye that residents need to be resourceful, using pantry staples, canned food, and frozen items. Hence, the “spinach, turmeric, lemon soup” is a handy starter to make in March. However, the soup is really Middle Eastern or Indian in flavour and ingredients, with lemon and turmeric. It becomes a thick, opulent soup, with a texture, complexity, and depth of flavour satisfying enough to serve as a filling lunch or dinner, when accompanied by hearty bread. The soup could be a nice starter for a wintry brunch, as well. My substitution of celery, I think, may have improved it, though I really do have to admit to having no basis for comparison. I made this recipe just once for a quick Friday-night island dinner. So you can try it either way. This would be a perfect dish to serve, followed by a rich chocolate dessert, such as a double-chocolate, double-malt iced brownie, to balance the wholesomeness with a bit of decadence, on a blustery wintry evening. Be sure to think of the desolate winters on the Isle of Skye, regardless of where you are. Sautee onions in butter over a medium heat for 10 minutes or until transparent and soft. Add the spinach and celery, stirring for two minutes. Add lemon rind, lemon juice, turmeric, chicken (or other) stock, salt, and pepper. Bring to a boil, reduce temperature to a steady gentle simmer, for 30 minutes, stirring occasionally. Take soup off burner, and puree it with an immersion blender, until the texture is uniform and is as smooth as you like. Adjust seasonings and served topped with a tablespoon dollop of yogurt. Add chili flakes on top, if you like a bit of heat, with your tangy-turmeric sassy-spinach soup. This entry was posted in Brunch, Main courses, Recipes Misc, Soups, Vegetarian and tagged Brunch, easy, lemon, nutritious, Recipe, Scottish, soup, spinach, vegetarian. Bookmark the permalink. Apparently our taste buds are in alignment this week—I refuse to make an insync reference. Ew. Too many bad memories of boy band obnoxious dancing. 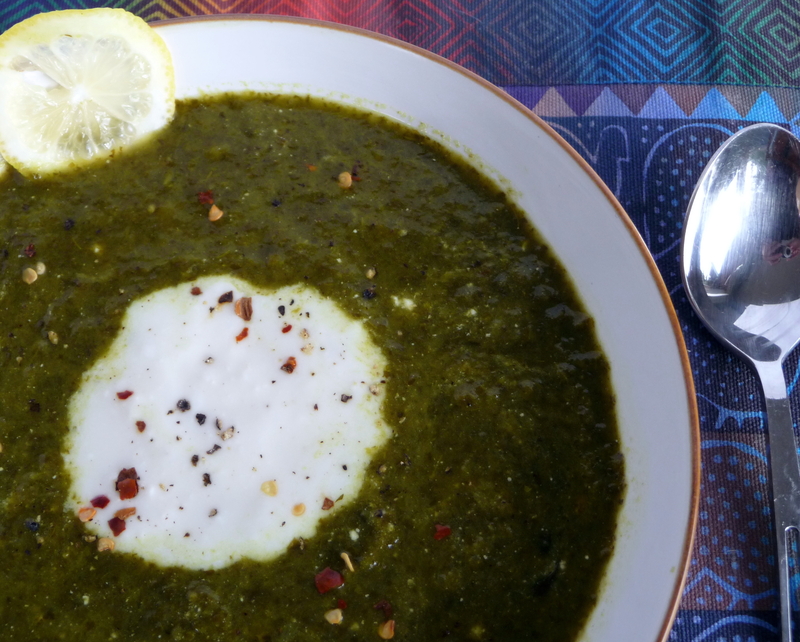 This spinach soup, though, looks lovely…I love the addition of lemon zest. Kind of perks it up a bit. Happy TGIF! Hi, Geni. I really didn’t want to scare you with a boy band reference, but you got it…ew, indeed. Your take on spinach soup was more classical Middle-European, while this went more Middle-Eastern. Regardless our soups were InSync, if not our musical tastes. I would give a try to this soup !!! Salut, Pierre. Tu aimerais cette soupe, je pense. Il fait beau chez nous, aussi, surtout pour le janvier! Thanks, Jax. It’s a healthful and tasty soup, but, more importantly, it does allow for rich desserts – my idea of a balanced meal…. I hope to see you soon out here! Wow, what an intriguing and delicious sounding soup. The combination of flavors sounds just so refreshing. Hi, Louann. Yes, I think it is refreshing, which is not an adjective that pops to mind with the words “spinach soup”. It is also different and unexpected – always good things in the culinary realm…. ooh yum! 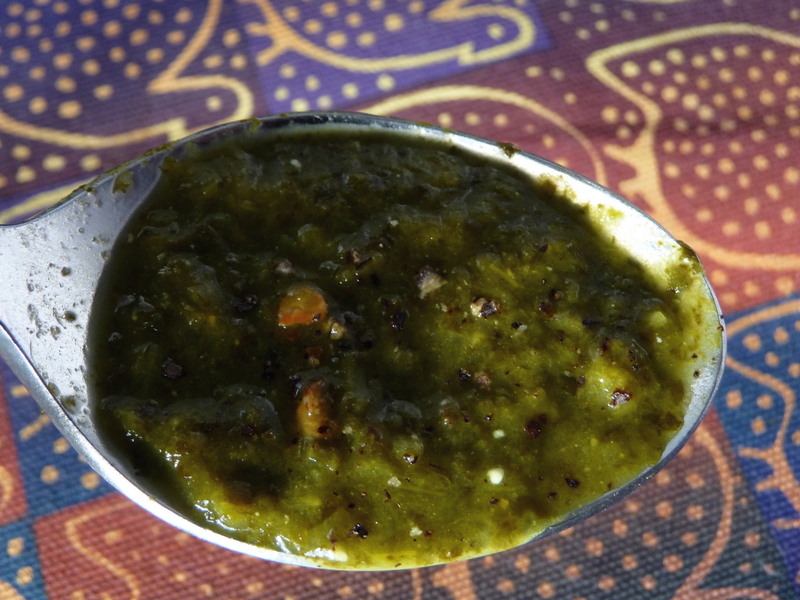 i just posted a sorrel pesto post and am planning to make a sorrel soup! very lemony, like this one. rich and wholesome… great description for your soup!